School holidays are a boon when you want a bigger project started which has turned out to be an education for the boys. They have learnt small things like how to de-nail salvaged wood and bigger picture things like how to orient a building to maximize heat retention in winter and utilize cool draughts in summer. 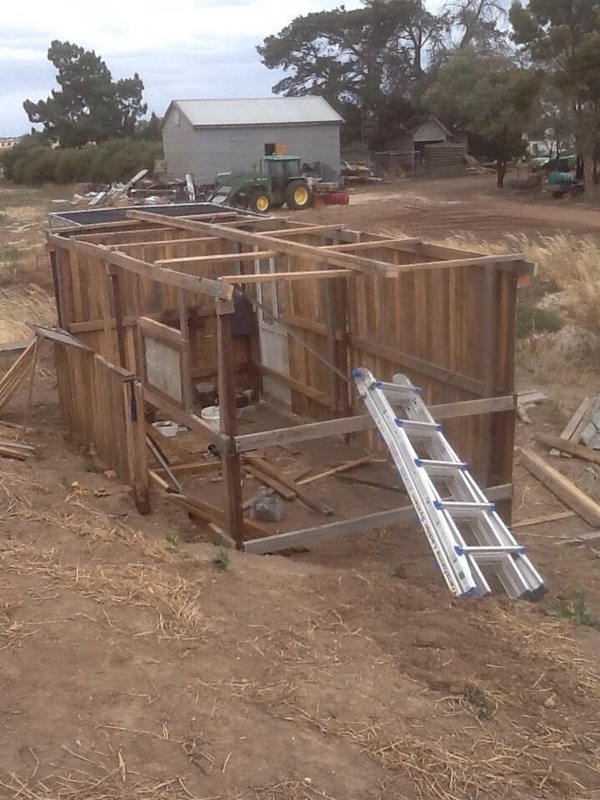 Building the chook run was a challenge as wire and myself do not have a happy relationship. Simply put I hate wire in any form. It does not do what I want it to do and seems to follow its own path thumbing its nose at me. Still it is up and functional with a dripper line around the outside watering Jerusalem artichokes on the south side and berries on the north. The wood mainly comes from leftover wood used to pack piping from the installation of the Wimmera Mallee Pipline, salvaged timber from the transfer station, steel posts from an old pig sty, galvanised roofing iron and nails from a windbreak fence that succumbed to wind, an old wire grain field bin, scrap netting and weld mesh from the farm rubbish heap. 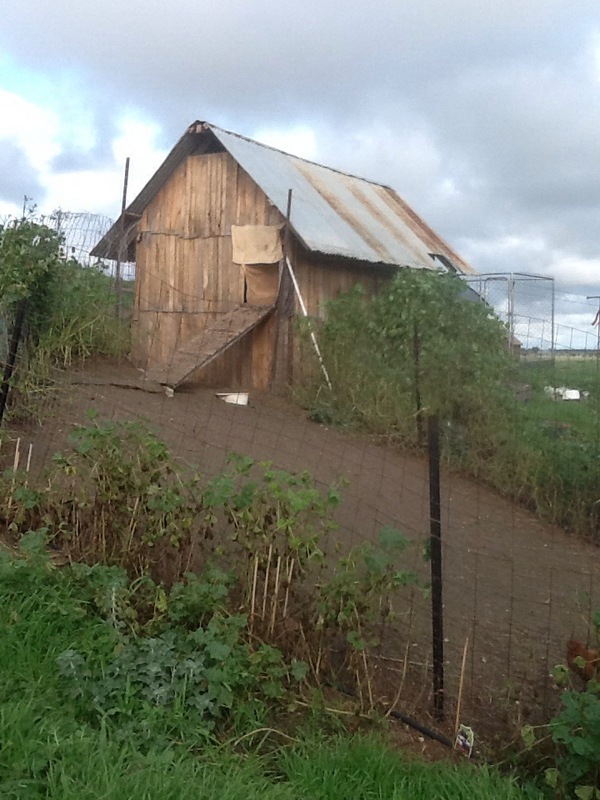 The site was chosen as it has some elevation to ensure good drainage and mud free living for the chooks. 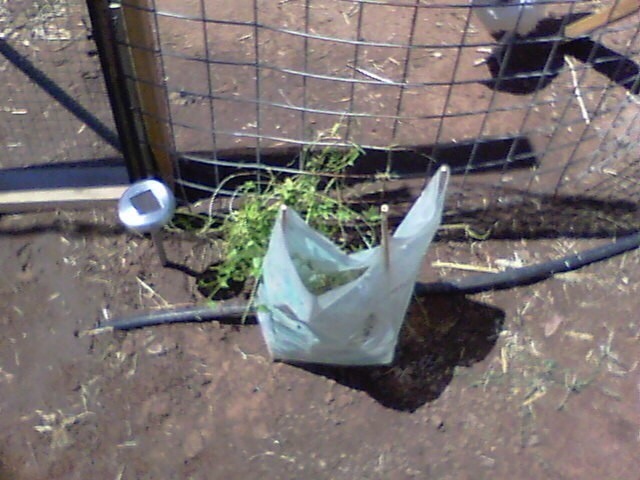 Any manure and nesting material is close to the veggie beds and excess vegetation from the beds is easily thrown over the fence to them to scratch through. Lachlan, Gordon and myself constructed it with advice from Father and took a month to complete. Showing construction method used and one of the two nesting box inspection and egg collection windows. Floor, door, windows and three walls up. Roof trusses made up and ready to go on with old gal roofing iron and nails. All recycled from stuff around the farm. 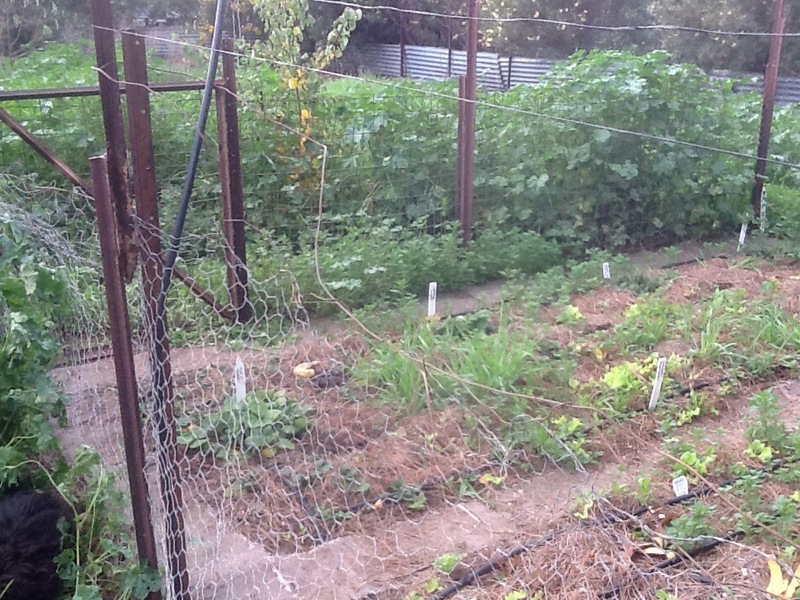 Veggie beds are between the chook shed and barn in the background with the tractor. 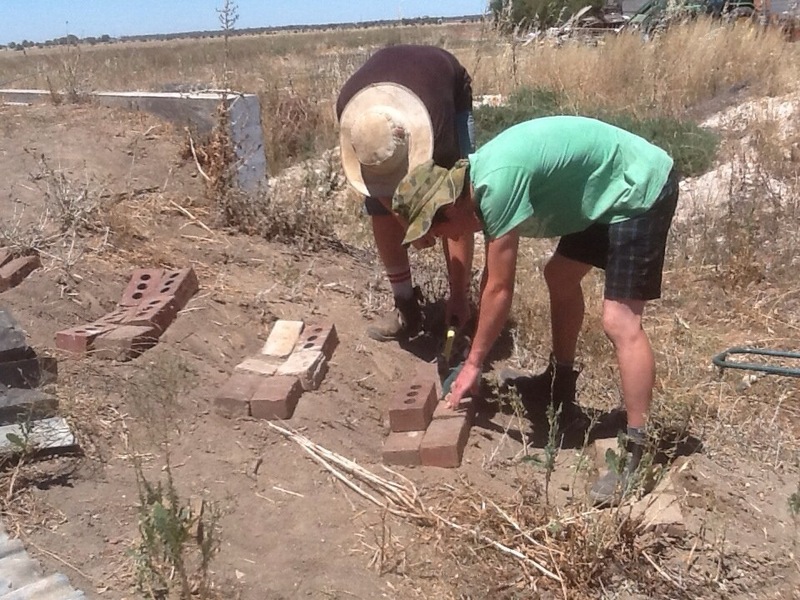 Lachlan and Gordon making the brick and mud stepping stones. They had to measure the distance from the chooks shed door to level ground, work out how many steps, cut the steps into the gradient and mud cement them in place. Did a good job and looks great at night with solar lights next to each one. Detail of run fence with dripper line and solar light. All our pots and trays are stored in the run so bugs move around at night and take cover in the morning. When chooks get fed you turn over the pots letting the birds do a clean up. Earwigs historically have been a big problem here with slugs running a close second. Will see what changes. 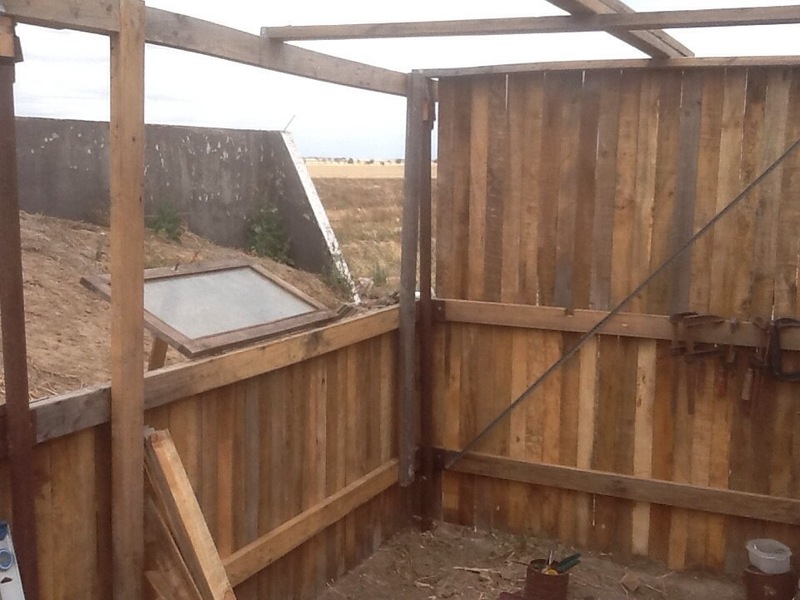 Last middle pic shows the chook run with summer shade hut. Also leaves one dry spot in the run in winter. 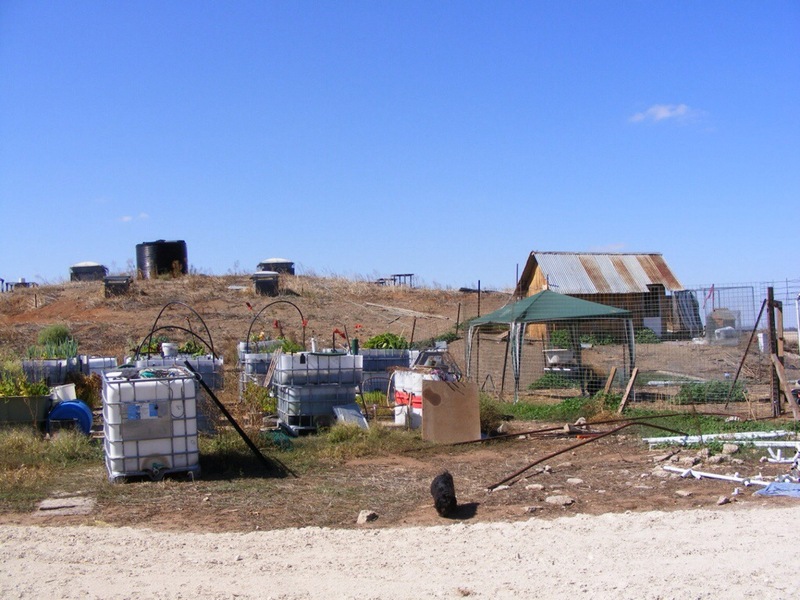 Next door is the aquaponics where any excess plant material gets thrown over to the chooks for them to pick thru. Terradome in background with the breeding tanks for the Silvers and Yabbies. In the height of winter the marshmallows are over six feet tall and provide the best wind protection during our frosty nights. Was going to lop them off but I couldn’t have planted a better windbreak as it turns out. The runoff from the roof and highly matured soil have given them a huge boost. Other marshmallows around the farm are only four foot tall like around the strawberry plot.